In a world where most everything is digital, I’m a pencil and paper planner. I just need to write things down to see the big picture. I like to color coordinate with pretty pens and I love to flip through the pages to see what’s coming and what’s already done too! So, reviewing The Ultimate Homeschool Planner by Apologia Educational Ministries is right up my alley. The first thing to say about this planner is that its pretty. And y’all, that’s really important! If I’m going to look at this planner every school day (plus planning days), pretty ranks right up there! Even better this planner is thorough. I can’t think of one thing I’d want to plan for my school year that isn’t included in this planner. Let’s start at the beginning. The covers have folder pockets on the inside perfect for gathering loose pages. I use the pockets for our co-op schedule and to keep the week’s tests until the day scheduled for the children to take them. I also keep a small post it note pad in one pocket. Anytime I schedule something tentatively I write it on a small post-it for easy revising later. I can’t stand marking things out in my planner, and post-its keep my planner pretty! Next are year-at-a-glance calendar pages from the 2015-2016 school year all the way through 2022-2023. That’s all the way through my oldest’s graduation year! These pages are perfect for me to look at the year and tentatively plan out our 36 weeks of lessons. I also like to mark known vacations here. Since I don’t use a preplanned curriculum with my children, detailed planning is something I do often. If you are new to planning, or feel lacking in that area this planner has a great planning tips section. It walks you through yearly planning, monthly planning, weekly planning, a Monday morning tutorial, and Friday afternoon weekly reviews. While planning is second nature to me by now, I really love the idea of a Monday morning tutorial. I’ve started this with my older children and it really helps to go over what is expected for the week all at once. It’s stopped so many interruptions in teaching, just by taking 15 minutes to go over the week’s assignment sheet. Next are the planning sheets. All the calendars are undated, so its okay to pick this planner up mid-year as I did. I use the yearly and monthly planners very minimally. Mostly to mark known days off, events, and such. Since I keep a detailed family planner separate from my school planner, I won’t use this section much. The weekly planning section is where I spend the majority of my time. The pages are really flexible, and it took me several weeks to find the right method for my family. With 6 columns and 6 rows on each page (plus notes, supplies, and appointments sections) there are several options for planning. I could use the 6 rows for my 6 kids, but since several aren’t yet school age I didn’t need all the sections for the little ones. I use the top 4 row boxes for my 4 oldest children, with our subjects going across the top 6 sections. Since there are 5 lines in each planning box I can put one assignment on each line for the week’s work. In the 5th row I put the supplies I need to gather for each day. It really saves me time to have it in one place to gather all at once rather than as the children realize they need something! The 6th row I use for myself and household things. I put appointments, my meal plan for the day, and any to-dos I need to accomplish during or just after school. On top of weekly planning the planner includes pages for records, grades, and reading lists. It even has a separate high school planning section. I’m really enjoying this planner! I think it’s great for anyone who prefers paper and pencil planning- particularly if you like all your school plans in one place for multiple children! 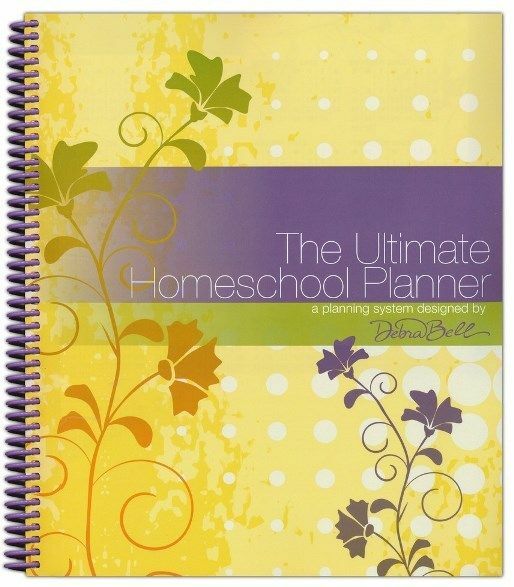 What to hear how other homeschooling Moms use this planner? Check out more reviews by The Schoolhouse Review Crew by clicking below.